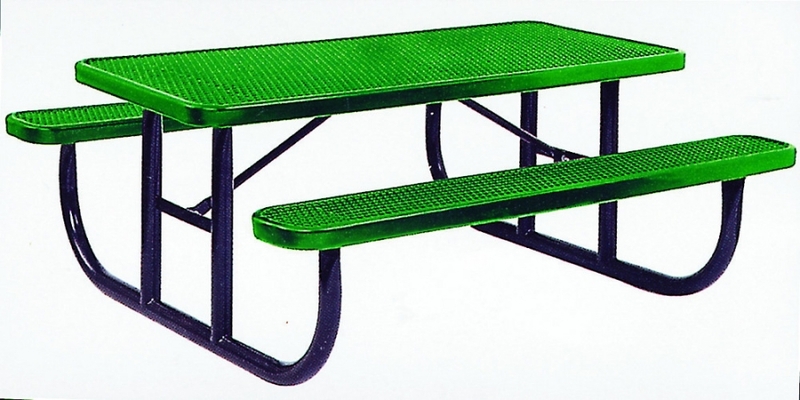 Kamp-Rite’s Kwik Set Table is the perfect solution for both indoor and outdoor activities. Featuring a heavy-gauge aluminum tube frame water resistant aluminum roll-top one aluminum support leg and non-skid rubber feet on all four legs the Kwik Set Table provides a convenient full size table that sets up quickly for any dining experience. Lightweight compact and easy to transport the Kwik Set Table is equally suitable for backyard bar-b-ques sporting events picnics in the park overnight camping trips or any time an extra table is needed for “in home” entertaining. The collapsible table rolls up in seconds and stores in a sturdy carry bag with shoulder strap for easy handling. Weight capacity - 90 lbs. Dimension - 45 L x 27 W x 27.5 H in. Discover a new solution for outdoor or indoor dining needs. The unique all-in-one design incorporates a roomy table with 2 folding benches that set up and fold down quickly and easily. The entire table is stored inside the bench compartments transforming into a self-enclosed easy to carry storage case with handle and comes complete with a storage bag. Table: 47 L x 38 W x 28 H in. Dimension: 48 x 9 x 11 in. Make meal time easy and fun with the Kamp-Rite 2 Tier Kwik Prep Table. The convenient counter-height design with wider table top makes meal prep a breeze. A handy shelf below provides space for a cooler food or cooking utensils allowing for a fully stocked kitchen within arm's reach. A comfortable night’s sleep has never been so quick to achieve! The Kamp-Rite EZ Fold Cot sets up in one easy motion without the need for an extra pair of hands. Just as easy to fold the EZ Fold Cot stores conveniently in a carry bag for easy transporting and storage. Dimension - 79 L x 28.5 W x 19 H in. The Double Folding Chair is an ideal choice for camping sporting events tailgating or simply relaxing in the back yard. The double-sized chair is constructed with a powder-coated steel frame and built sturdy to provide comfortable seating for two. Cup holders in each arm keep beverages close at hand. Lightweight portable and easy to carry in it’s own convenient carry bag the Double Folding Chair is the perfect answer to cozy relaxation anytime anyplace. Open: 42 L x 18 W x 17 H in. Dimension: 42 x 10 x 10 in. Strong comfortable and convenient the Kamp-Rite Director’s Chair with Side Table is great for the boat campsite tailgating and more. The strong yet lightweight reinforced aluminum frame supports up to 225 lbs. The oversized padded seat and chair back feature heavy-duty polyester fabric while the curved armrests are angled for ergonomic comfort. Easy to fold easy to carry the Director’s Chair with Side Table delivers comfort and function to any outdoor event. Dimension - 20 L x 34 W x 38 H in. Enjoy your patio or backyard leisure time with the strong and durable Shore Outdoor Aluminum Bar Table. Made with an anodized brushed aluminum frame and non-marking black plastic foot caps Shore features tone-on-tone grays with wood accents on the paneling for a chic and minimalist look. The Shore Outdoor Aluminum Bar Table complements your casual gatherings with a look and functionality that you can rely on. Enjoy your patio or backyard leisure time with the strong and durable Shore Outdoor Side Table. Made with an anodized brushed aluminum frame and non-marking black plastic foot caps Shore features tone-on-tone grays with wood accents on the paneling for a chic and minimalist look. The Shore Outdoor Side Table is a piece built to last with the versatility you’ve been looking for in an outdoor side table. Enjoy your patio or backyard leisure time with the strong and durable Shore Outdoor Dining Table. Made with an anodized brushed aluminum frame and non-marking black plastic foot caps Shore features tone-on-tone grays with wood accents on the paneling for a chic and minimalist look. The Shore Outdoor Dining Table complements your casual gatherings with a look and functionality that you can rely on. Enjoy your patio or backyard leisure time with the strong and durable Shore Outdoor Aluminum Coffee Table. Made with an anodized brushed aluminum frame and non-marking black plastic foot caps Shore features tone-on-tone grays with wood accents on the paneling for a chic and minimalist look. The Shore Outdoor Aluminum Coffee Table complements your casual gatherings with a look and functionality you can rely on. GEOMETRIC DESIGN ALUMINUM COFFEE TABLE - SILVER Surprisingly light, this aluminum coffee table can be also used as side table, bedside table, end table, etc. It will become the focal point of any room, and complement a variety of furniture styles. This coffee table has a sturdy tabletop, on which you can place magazines, remote controls, food or drinks, or display decorative objects like photo frames, or even potted plants. The coffee table is made of high-quality aluminum with a polished finish, which makes it extremely durable. FEATURES Colour: Silver Material: Aluminum with a polished finish Dimensions: 69 x 69 x 35 cm (W x D x H) Completely handmade Easy to clean PACKAGE CONTENT 1 x Geometric Design Aluminum Coffee Table - Silver Note: This order will be dispatched from our Sydney/ Melbourne Warehouse. This item may arrive in a separate delivery to the rest of your order. Usual dispatch time is 1-2 business days from order. One person stand-alone sleeping cot. Perfect product for any occasion which requires extra sleeping arrangements. Opening and closing in seconds makes the Kwik-Cot the perfect choice for a quick and simple to use product. Folding into a 7 x 7 x 39 inch package makes the Kwik-Cot easy to store in its own carry bag. The “Military Style Folding Cot” provides a comfortable night’s sleep while camping outdoors or at your hunting cabin. The aircraft gauge aluminum legs are reinforced with steel hinges and supports. Two “snap-on” end braces and three scissor action folding legs make for easy set up. Strong enough to support up to 300lbs the “Military Style Folding Cot” features a washable durable 600D polyester fabric cover and includes a sturdy Carry Bag for convenient transporting and storage. Dimension - 76 L x 25 W x 13 H in.